Chris Hadfield is a retired Canadian astronaut and former commander of the International Space Station. During one critical spacewalk, floating anti-fog got into Hadfield’s eyes, making him temporarily blind. Later, in his TED talk, Hadfield described his thought process: “Okay, I can’t see, but I can hear, I can talk, Scott Parazynski is out here with me. He could come over and help me. … I could find my own way back. It’s not nearly as big a deal.” Hadfield developed the ability to calmly search for alternative solutions through hundreds of hours of training with NASA. His excellent problem-solving skills allowed him to serve the mission even while he was temporarily blind. Chris Hadfield stands next to Haben Girma and her guide dog Maxine at the Clio Cloud conference in New Orleans. Photo curtesy of Clio. Designing accessible space shuttles and space stations would increase an astronaut’s ability to continue working even while experiencing temporary or permanent disabilities. Disability is not a barrier for highly trained problem-solvers, but lack of access is. Developing workstations and tools that communicate information in multiple formats — visual, sound, tactile — would allow astronauts to access the necessary information even when one of their senses has been obstructed. The principles of universal design, if implemented, would significantly increase the success of space exploration. Applying universal access to space missions has another benefit: NASA and other space agencies could open their programs to people with disabilities, tapping into a large talent pool of over 1.3 billion people. Scientists and engineers with disabilities are already making strides in research centers around the world. A Financial Times piece I recently published highlights some of the innovations sparked by people with disabilities. Take a moment to imagine the breakthroughs we stand to gain by increasing access to our skies. We’re a long way from a fully accessible space station, but everything starts with a dream. Several organizations are working to make space exploration more accessible. The Xploration Station awarded the 2017 #StudentAstronaut prize to Julia Velasquez. Julia has her heart set on becoming the first Deaf astronaut. On the other side of the sensory spectrum, NASA has partnered with the National Federation of the Blind to launch a rocket camp for blind high school students. The NFB hopes to one day send a blind astronaut to space. With the right tools and training, people with disabilities can work as astronauts. Earlier this year I met with Buzz Aldrin, one of the first two humans to set foot on the moon. Buzz assured me that one day I’ll be able to travel to Mars. 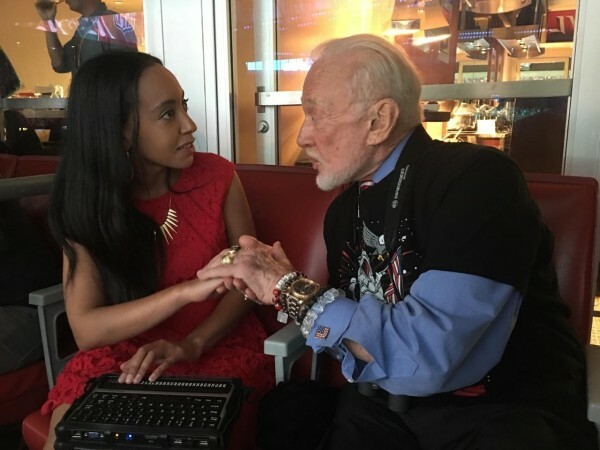 Perhaps not in his lifetime; but in my lifetime, Buzz predicts that people with disabilities will be able to explore Mars. Talking with Buzz, I learned that the sky is not the limit. Not at all. The sky holds infinite possibilities.